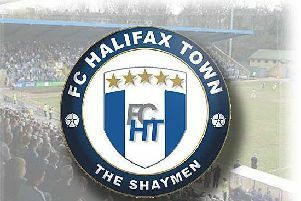 The National League’s bottom two go head-to-head in a crunch clash when FC Halifax Town host Kidderminster at The Shay on Saturday (3pm kick-off). Both clubs have just one win between them so far this season, which came when Halifax beat Barrow 3-1 in their last home outing. Jordan Burrow, pictured above, scored his sixth of the season in that win, and is joint top-scorer in the division along with Gateshead’s Ryan Bowman. Despite being 23rd in the table, Town are the 11th highest scorers in the league, but have the worst defensive record having conceded 17 goals; Kidderminster have the joint second-worst tally with 15. Only Dover, Grimsby and Wrexham have more shots on target than Kidderminster, while only Southport, Boreham Wood and Braintree have had fewer than Town’s 27 shots on target. Kidderminster have gone 18 games without a clean sheet in the league, the worst record in the division, while Town have the second worst record with 16 matches. Harriers also have the worst record for games without a win, 13, and without an away win, 12. Gary Whild’s side have actually collected more points away than at home this season, with impressive draws at Tranmere and Gateshead. Their last away win came at Aldershot on January 20. Both teams go into the clash on the back of defeats, with Town losing 3-2 at Aldershot and Braintree winning 1-0 at Kidderminster. Defenders James Bolton and Matty Brown both missed training on Tuesday but could be in contention to play. Winger Sean Tuton had an X-ray on Sunday on his ankle injury which revealed there was no break but isn’t expected to feature.